SoftPoint products contain no free silica. Crystalline silica (quartz) can be hazardous to your health. Breathing crystalline dust can cause the occupational lung disease silicosis and may cause cancer and scleroderma. Always follow OSHA health standards when using crystalline silica dust. SoftSand particles are rubber-based granules that were specifically designed for coatings applications. These colorful particles will help provide a comfortable, skid resistant surface, and will work in most urethane, epoxy, and acrylic coatings. SoftSand rubber particles can be blended together, and used with paints to provide truly unique, functional and decorative coatings. SoftSand rubber particles can be used in the same manner as sand and other commonly available skid resistant additives. The particles can be either mixed directly into the paint, or they can be sprinkled onto the wet paint, after it has been applied. SoftSand rubber is compatible with most urethane, epoxy and acrylic paints. SoftSand rubber can be mixed into the paint, and applied with either a paint brush or roller. As with other non-skid aggregates, the appropriate mix ratio can vary. 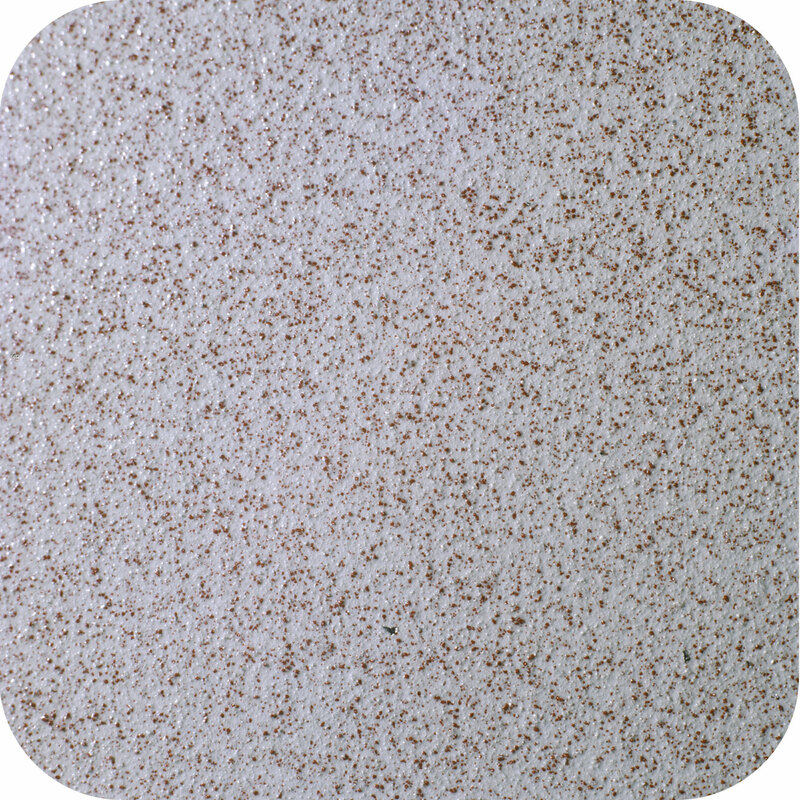 In general, 10-20% SoftSand rubber particles by weight will provide a desirable textured finish for a non-slip surface. For most paints, this ratio amounts to one-quarter (¼) pint of SoftSand particles for every pint or quart of paint. The best way to determine your mix ratio is to mix paint and SoftSand rubber in a separate container, and apply a test patch to the paint area. To get the most accurate sense of what the final product will look like, apply the mixed paint to a flat piece of cardboard or plywood, and allow it to cure. Then apply the second coat of paint to get the final affect. Adjust your final mix ratio based on the appearance of this test patch. You can use either a brush or a roller to apply the mixture of paint and SoftSand rubber. Slight differences in appearance may occur depending on which method you choose. In some cases, the particles will accentuate the pattern left by brush strokes. A second coat of paint, which is generally recommended, will reduce this affect. A roller with a tight nap tends to apply a nice uniform coating of paint and particles. The roller tends to deposit the particles in small, evenly distributed clusters. These clusters lead to a slightly more aggressive profile than the broadcast method described below. As with brushing, a second coat of paint is recommended. Sprinkling the particles will create the most uniform, textured appearance. When completed, the coating should look somewhat like fine sandpaper, but it will be much more skin friendly! In this method, the SoftSand particles are not mixed into the paint. Instead, they are sprinkled onto the coating after it has been applied. The rubber particles will stick to the wet paint. Be sure to allow enough time for the coating to self-level before sprinkling the particles onto the coating. In addition to providing functional, skid resistant coatings, SoftSand rubber particles can be used to create beautifully textured, decorative coatings. These coatings can be applied to walls, floors, doors, etc. Below are some ideas for creating unique coatings with SoftSand rubber. Click images below for better resolution. 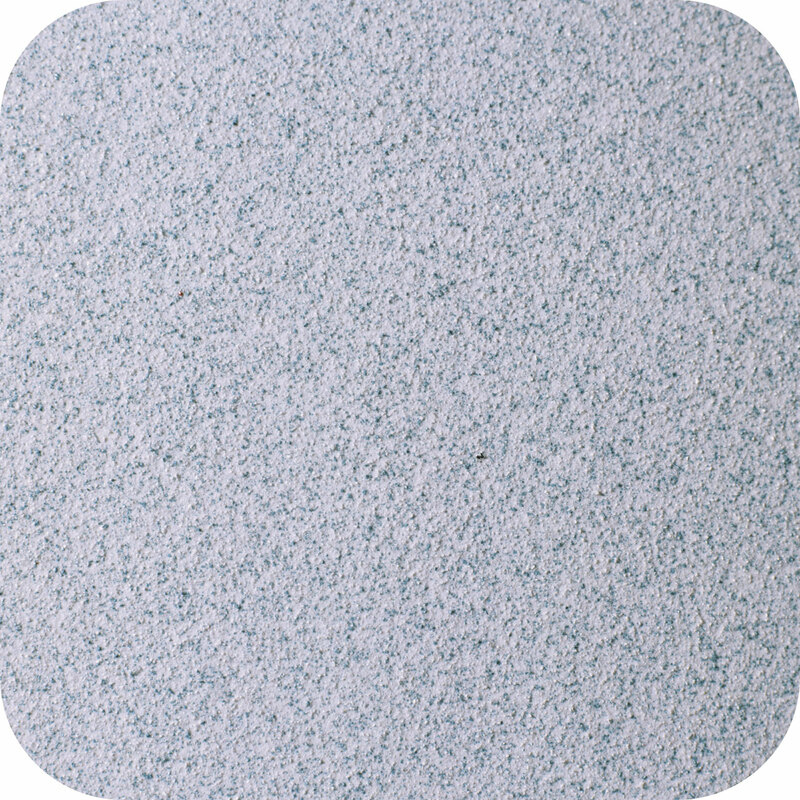 The different colored particles can be blended together to create a stippled or variegated appearance. 3-D effects can be accentuated by the use of clear resins, as described below. SoftSand rubber particles are available in five standard colors to match most paints. The simplest combinations are white particles with white/off white paint, gray particles with gray paint, red with red, etc. This color matching eliminates the problem other rubber based (scrap tire) paints have: as the coating wears, the black particles become noticeable, creating a dirty, worn appearance. In this system, blend the desired particles together thoroughly in a separate container. Examples of blends are three parts of white to one part of any other color (three scoops of white, one scoop of red or gray), or 5 to 10 parts white to any one part of one or more colors (10 scoops of white, one each of red and gray). To highlight your color scheme, follow one of the two methods below. A clear resin system (epoxy or urethane) combined with a blend of colored granules will create a unique 3-D effect. Since the resin is clear, the final appearance will be that of the color blend. A background color, applied before the clear resin, will highlight the 3-D effect. An example of this system would be white paint, clear epoxy, and SoftSand rubber particles. The particles can be sprinkled onto the coating, and then rolled or brushed to distribute them. The same decorative blends created above can also be used with colored coatings. Sprinkle the particle blend onto the coating after it has been applied (mixing the particles into the colored paint won’t work here). Allow the coating to cure, and remove any excess material. In this system, the color provided by the paint becomes part of your decorating scheme, depending on how heavily you sprinkle or broadcast the particles. Once the excess particles have been removed, apply a clear finish coat. A clear urethane, epoxy or acrylic sealer will work. To highlight the soft feel created by the rubber particles, try using a flexible top coat.